What if we told you you could collaborate easily, accounting for internal and external governance – while pushing everything back to your electronic document management system and record your interactions as you go? Our online collaboration soluion allows just that. Collaborate and share your documents, securely, with internal and external stakeholders all with direct links to your Electronic Document Management System. Objective Connect offers councils a seamless ‘single source of truth’. Simply drag and drop one or more documents into Objective Connect and they are available for anyone you have invited to the secure workspace. Secure – All files have end-to-end encryption. Audit Trail – Every interaction is tracked. Large Files – Send and receive files up to 1GB. Version Control – Every version is retained. Alerts – Stay up-to-date with email alerts. 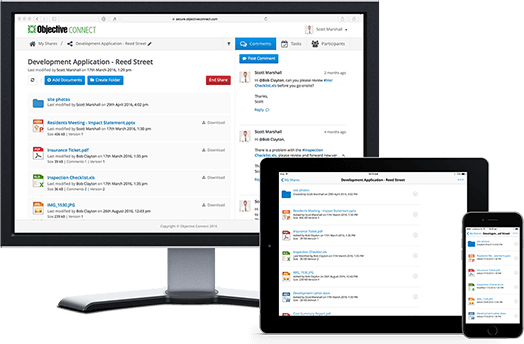 Objective Connect can integrate with many popular EDRMS including MS SharePoint, HP TRIM and Objective ECM. Simply right-click from within your EDRMS to share a document or a folder and start collaborating. Often the conversations you have when collaborating provide context, and at times can be just as important as the documents being shared. Before Objective Connect, this conversation was spread across a multitude of emails, conversations, file notes, making a single record virtually impossible. With Objective Connect it is easy to initiate a new conversation or reply to one that has already started. Simply mention a participant’s name in a conversation and they are instantly alerted. Direct attention by linking documents in the conversation. Everything is recorded in the secure workspace. Deliver complete transparency to everyone involved, including exactly who was asked to do what and when they needed to do it by. Create tasks to acknowledge, review and approve decisions, keeping everyone informed. Bottlenecks are removed and work just flows. Objective Connect unlocks the full potential of any project by enabling a collaborative approach to engagement and participation. Document sharing becomes a single click option from eDMS platforms like HP TRIM / RM8 / CM9 and Objective’s ECM ensuring that all interactions are logged and your data remains safely within a single source of truth. Interact with stakeholders in real time, without having to send emails or lodge your every move (allow Connect to do the record management for you). Governance safety means the documents remain in your eDMS. Control the access across all levels, giving staff, agencies or stakeholders individual document sharing/receiving rights. Audit and trace with every interaction within your secure workspace is logged into an audit trail to ensure full transparency. Thanks so much for taking the time to contact our eApprovals team. Helping teams collaborate and improve customer experience through effortless file sharing is one of our favourite things to do.